The suicide bomber was being chased by security operatives when she detonated the bombs strapped to her chest. About 13 other worshipers were also left with threatening injuries in the deafening explosion. Danbatta Bello, the spokesman of the Civillian-JTF, confirmed the incident. He said the mosque attack took place at Zannari street along Maiduguri-Dikwa road. “They were two girls that wanted to attack the mosque but one of them got stuck in the barbed wire in the ditch dug near the area. The second one escaped and began to run. Our operatives there began to chase her. “She rushed to the mosque and detonated the second bomb,’’ Mr Bello said. 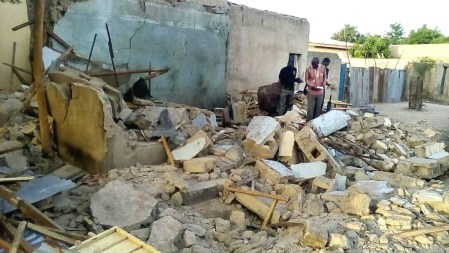 Mr. Danbatta added two other female suicide bombers were gunned down at Mamanti street of Maiduguri at about the same time the mosque was attacked. “We now have a total of 12 persons that were killed and about 13 injured,” said Mr. Danbatta. The police is to officially brief the media later. The town has been under serial attacks by suicide bombers in recent weeks.